While the White House is Reverting Back to the 1950's, Damien Chazelle Pays Homage to the Musicals and Films of the 1950's. As a person who has a dark soul, I do not care for musicals. There are few that really leave an impression but most don’t click for me. 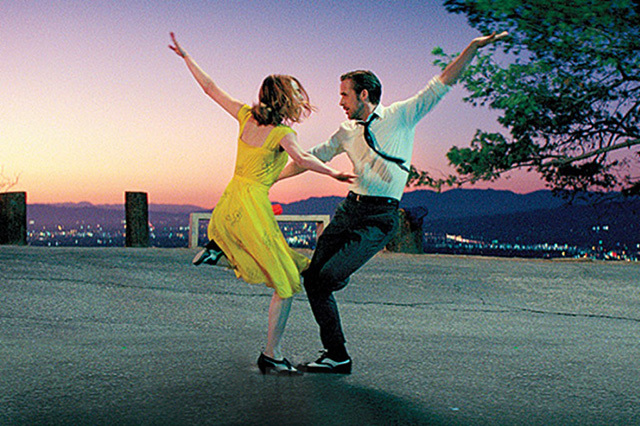 La La Land is one of those ones that will leave an impression for a lifetime. Let’s get reel and break this down. Simply, pure movie magic; like with Whiplash, Chazelle creates another film destined to be a classic. The musical drive to the story works and really adds a balance of fun and emotion. The visual cues and bright colors harken back to old school film making and never feel like it was trying too hard. The romance itself is very charming and lovable, while also being different and unconventional for a typical romance film. Chazelle makes it very, very difficult to hate this film and not put a smile on your face from beginning to end. The chemistry between Ryan Gosling and Emma Stone is palpable and you would be convinced they are a real life couple. The characters are rich and animated sometimes but never feel like they aren’t grounded. They both are magnetic to watch and I could have watched them for two more hours. While he did a fine job, John Legend was a bit of a distraction. Like I said, not a bad performance, but the other actors are miles above him and it shows. The long, beautiful takes, the vivid colors, the stunning art direction and superb lighting all click together to make this pure visual eye candy. Tom Cross, editor of Whiplash too, makes a tightly edited story that never slows down and is paced perfectly making it snappy for the musical numbers and slower for the more dramatic scenes to really let the emotions and characters breathe. The practical sets and green screen shots were dream-like and put you into this magical world of music and storytelling. The music is catchy and heart-breaking making you hum it all the way home after the movie. This is why I love going to the movies. Out of the handful of musicals I have seen, this is one of my favorites and gets better and better each viewing. You will feel crushed by the fantastic climax but ultimately feel the charm and likability wash over you from everything prior.